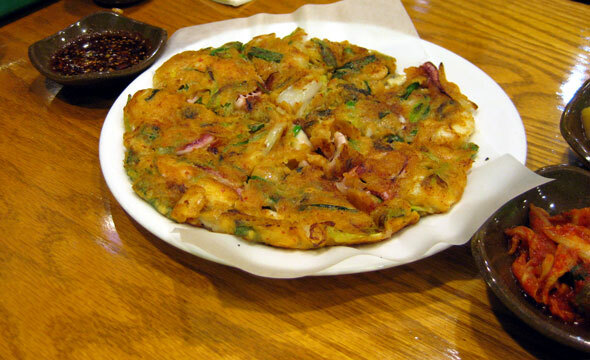 Sunrise House is a newly opened bun-shik, or "minute restaurant" in Koreatown . And a $60 parking ticket is a painful thing, so when my sweetheart got one last week, I decided to treat him to some spice-therapy - dinner at Sunrise. Fresh from the injustice of his ticket, my darling was awash with negative feelings, declaring "I just want to eat something crappy and not good for me!" Although I can't say our meal was crappy, it definitely satisfied his desire for unhealthy treats (ramen noodles, anyone?) And since it was Korean food, it contained enough gochujang to pepper his sadness with enhanced happy endorphins, ensuring that the glum bum who entered the restaurant exited a happy guy. An authentic replica of the quick-cooking, no fuss home-food restaurants that keep Korea thriving, Sunrise House presents a classic menu of spicy soups, noodles, dumplings, fried rice dishes, pancakes and meats. Bonus: all prices include tax. We spearheaded our ingestion-therapy by ordering three of our favourite Korean dishes: Kimchi and Seafood Pancakes, Kimchi Stew with Tuna and Ra Bokki (rice cakes and ramen noodles in red pepper sauce). Soon after, our server appeared with a tray full of banchan, or side dishes. "If you need more," she pertly declared, "call me". With these words the frowning corners of my lover's lips haltingly quivered upwards. These six little side dishes were a feast in themselves and my hungry man and I tucked in with relish. Crispy bean sprouts, and two types of kimchi were tasty, but my favourites were soft, brothy potatoes in a salty chicken base and sweet-soy seasoned seaweed. Barely had we started our appetizers when our brisk server returned with the mains, a bubbling pot of kimchi stew, our crispy pancake and the saucy noodles. Koreans aren't kidding around when they call these places minute-restaurants. We started with the pancake. It was golden-crusted and chock full of sea creatures - cuttlefish, octopus and soft mussels. Similarly, the kimchi stew was bursting with tuna, a rare treat in Toronto. 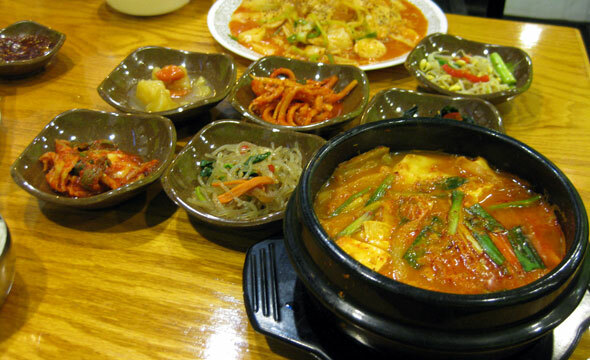 Since canned tuna is relatively new to Korean cuisine, and since most Korean restaurants were founded by Koreans who have been in Toronto awhile, kimchi stew in this city usually features the traditional pork. I developed a taste for the modern tuna version during a 3-year sojourn in Seoul, and always feel grateful to the few Toronto places that serve it. A steaming mix of spicy stew, salty tuna and soft tofu, Sunrise House's version is just how I like it. 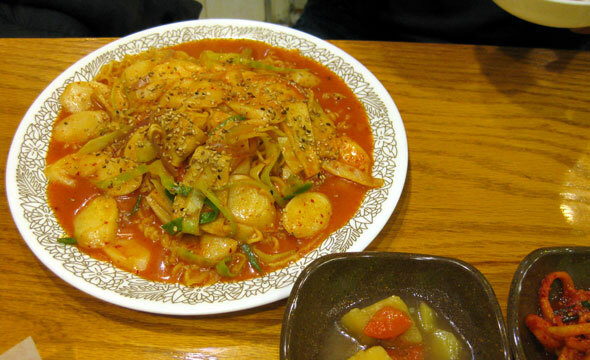 Our last dish, Dok Bokki was all pepper-pasted ramen and rice noodles. The noodles were perfectly springy, complimenting generous slabs of soft fish cake. The only thing missing were pieces of hard-boiled egg. Still, this dish more than the others achieved the real purpose: burning away my lover's sad thoughts and replacing them with a belly full of delicious, spicy treats. At $19 plus tip, the dinner had erased, at least temporarily, my sweetheart's worry about his ticket, and proved that smiles always come cheaper than frowns.